The Keeping of Lights is a collection of new poems from surrealist poet, Alexander Romanovich. In this volume, the author's poetic sensibility lures readers far away from the mundane and conventional experiences of daily life to uncover a more revealing world - exotic, dreamlike, full of mystery and mythology. The sensual imagery and marvelous landscapes of the mind act as a stage for an odyssey of love, metaphysical discovery, memory, and personal transformation. 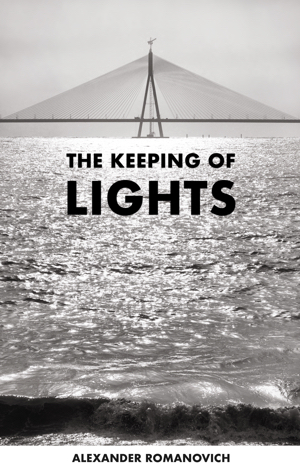 Selected for the 2019 Poets House Showcase in New York City, The Keeping of Lights will be featured in an interactive exhibition celebrating recent works of the poetry community. In this collation of poetry, Romanovich recalls the imaginative and marvelous poetics of the original Surrealist movement in France, led by its founder André Breton. Adhering faithfully to the central goal of liberating the imagination, these poems range from the whimsical and the mysterious to the exotic and dreamlike. Through each one runs a current of mythological themes, reimagining the universe through a paradoxical and transformative genesis. His sensual yet startling juxtapositions will delight and surprise readers willing to take the plunge into the depths of the subconscious mind. Both the Symbolist poets and the Surrealist movement set out to wage war on logic, linearity, and reality. NYC Poet Alexander Romanovich takes up the charge with his chapbook, "Mythopoeia." This volume is filled with startling, wonderful images, neologisms, and portmanteau words that soar off the page. Infused with the amorphous logic of dreams, and an adherence to texture makes this not so much a book of poems as much as a book of spells. In spite of the obscurantism rampant in these pages, there is a crystalline clarity to the moods that Romanovich evokes. Rather than dwelling on darkness, the author creates complex images full of luminous tranquility. Romanovich's work arises from the same hallowed ground that gave birth to the glossolalia of such musicians as Sigur Ros, Cocteau Twins and Lisa Gerrard (an admitted influence - a poem here is even entitled "Yulunga"). -- Craig Laurance Gidney, author of "Sea, Swallow Me"
Born in Providence, Rhode Island, Alexander Romanovich now lives and writes in New York City, and has been actively engaged in Surrealism & Surrealist activities for much of his life. This work has involved writing poetry and fiction, group collaborations, performance, as well as film and video production. He is a graduate of New York University, where he earned degrees in both film and psychology. Alexander is continually inspired by a love of mythology and metaphysics, topics which regularly influence and shape his work. Comments, questions, inquiries? Please e-mail info@listeningcolors.com.